Who is an authority in your family? Is there more than one person? Make a list of some authorities outside your family. Can you think of a person who is an authority in one situation and not an authority in another? Are there any situations where you are an authority? How do you show respect for the people you listed who have authority? How can showing respect for authority help a group work together well? How can disrespecting authority affect a group? (For example, what if no one in a classroom followed the teacher’s instructions?) What happens when you don’t feel respect for a person in a position of authority? Can you and should you still behave respectfully toward them? 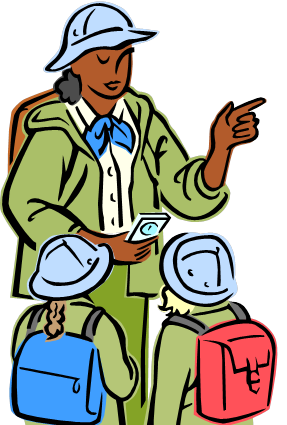 How do other parts of the Girl Scout Law give you guidance? Where else can you go for guidance? Have a conversation with your advisor, a parent or caregiver, or another trusted adult about what to do in situations where you think the person in charge isn’t behaving appropriately or treating others well. Unitarian Universalist congregations have what is called “a congregational form of government.” Find out what that means. How is a minister “called” to a Unitarian Universalist congregation? How are congregations connected with one another and with the Unitarian Universalist Association? How is the democratic process used in congregations and the UUA? Look at UU Principle 5, which says, in adult language, “The right of conscience and the use of the democratic process within our congregations and in society at large,” and in children’s language, “We believe that all persons should have a vote about the things that concern them.” Who has authority in a democracy? Using your authority as a voter well depends on thinking carefully about questions and decisions before voting. Find out about one issue of importance to your family, congregation, or local community. How can you express your thoughts on the issue?